AzoPro S is a balanced mixture made of the best animal proteins available on the market. Indicated for alkaline soils as a consequence of its high allocation in terms of SO3, it aims to the reduction in soil pollution through the deployment of an adequate quantity of Nitrogen, provided as a result of the organic and ammoniacal proportion. The recommended quantity for hectare widely falls under the parameters imposed by the Nitrates Directive without negatively affecting the qualitative and quantitative crop production and also keeping an eye on costs for an appropriate economic return of the agricultural holding. AzoPro S contains selected tectosilicates mixed up together with raw materials: they are produced with a particular manufacturing technique, they make the product uniform in its physical shape when collected into pellets. They can also be spread with any agricultural equipment, reducing that way the distribution costs. Getting in contact with damp, they quickly melt making, so that, the nutrients available. The existing organic substance positively influences the cation exchange in the soil, the water and nutrients treatment, the latter are absorbed progressively according to the needs of the plant. 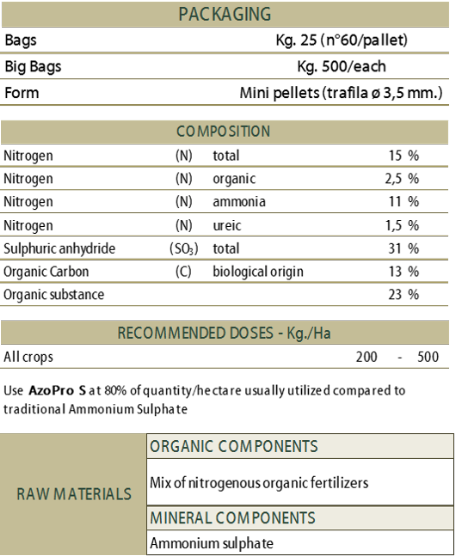 The composition and the balance between raw materials in AzoPro S, allow nutritional operations in crops with important savings compared to traditional fertilizers. AzoPro S is definitely more effective and more efficient compared to the ammonium sulphate during agricultural production cycles, both for the influence on the pH of the soil, and for the balanced and the regular release over time of carbon and nitrogenous fraction.